For fans of Red Dead Redemption comes a thrilling fantasy Western hybrid from the team that brought you The Sixth Gun! 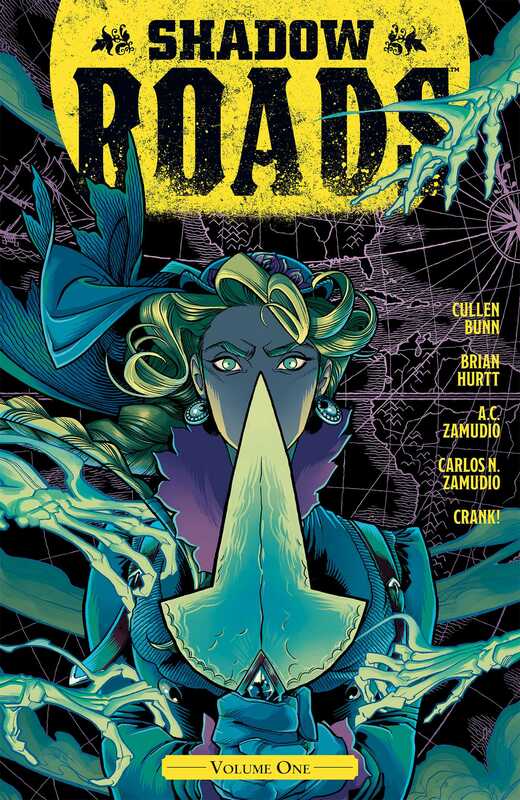 SHADOW ROADS, a stand-alone story, is set in the world that remains after the conclusion of Cullen Bunn, Brian Hurtt and Bill Crabtree’s critically-acclaimed series, The Sixth Gun. The world is thinnest at The Crossroads, a mythical plane that serves as a doorway throughout the universe. It is here that a band of adventurers throughout the Wild West gather, brought together by Kalfu and Abigail Redmayne with a singular purpose: to fight back against the creatures that would endanger the sanctity of all creation. Collects the first arc, issues 1-5. CULLEN BUNN is the writer of comic books such THE SIXTH GUN, SHADOW ROADS, THE DAMNED, HELHEIM, and THE TOOTH for Oni Press. He has also written titles including HARROW COUNTY (Dark Horse), UNCANNY X-MEN, and DEADPOOL AND THE MERCS FOR MONEY (Marvel). Cullen claims to have worked as an Alien Autopsy Specialist, Rodeo Clown, Pro Wrestling Manager, and Sasquatch Wrangler. He has fought for his life against mountain lions and performed on stage as the World’s Youngest Hypnotist. Buy him a drink sometime, and he'll tell you all about it.